You may have already come across Baby Bijou Designs on Instagram or Facebook, but I thought it was time I officially introduced you here. To do so, I thought it would be fun to answer a series of questions about my business below. 1. For starters, what exactly is Baby Bijou Designs? Baby Bijou Designs is a company I started that is named after my daughter’s nickname, Baby Bijou (more about the fun story behind her nickname can be found by clicking here!). I create original designs for baby clothing and nursery decor, often incorporating my love of travel and my experiences from living in Japan into my work. 2. What has been your favorite part of having your own company so far? I think I actually have a few favorite parts so far. The first would be that I can work my schedule around my daughter’s schedule, and also that I get to be creative in my business. The second would be all of the collaboration that is possible with Baby Bijou Designs. I do a lot of custom work, which has included everything from custom-designed clothing (for babies, children and adults) to custom frames, mats, prints and more. It is really fun to be able to not only personalize designs I create, but to work with others to make their original ideas into a reality as well. 3. What are some of your goals for your business? My biggest goal for Baby Bijou Designs is just to continue having fun with it. It is super exciting to create items I love, and even more exciting when I get feedback that shows other people also enjoy my work. Getting to see babies wearing clothing I create just makes me swoon, though I must admit I’m especially biased when my daughter dons Baby Bijou Designs! Eventually I’d like to save for my own camera so that I can learn to take better pictures for both my business and for my blog, but in the meantime I just hope to keep getting the word out there that Baby Bijou Designs is here and that I’m always up for collaboration! 4. Where can we learn more about how you got started and why you chose to work from home and for yourself? You can read all about how I decided to leave my part time job and what starting my business was like by checking out my guest post on the lovely Kara Hanes Photography Blog. I talk about launching the business and how things are going so far – be sure to check it out and leave me some advice! 5. Where can we find Baby Bijou Designs online? Please feel free to peruse my Etsy shop at babybijoudesigns.etsy.com, and follow Baby Bijou Designs on Instagram and Facebook as well! Thank you for letting me share about my business with you. I’d love to hear from you – what would you love to see from Baby Bijou Designs? What are your favorites in the shop so far? Also, please enjoy 10% off anything in the Baby Bijou Designs shop with the code BIJOUTHANKSYOU before June 30th, 2017! 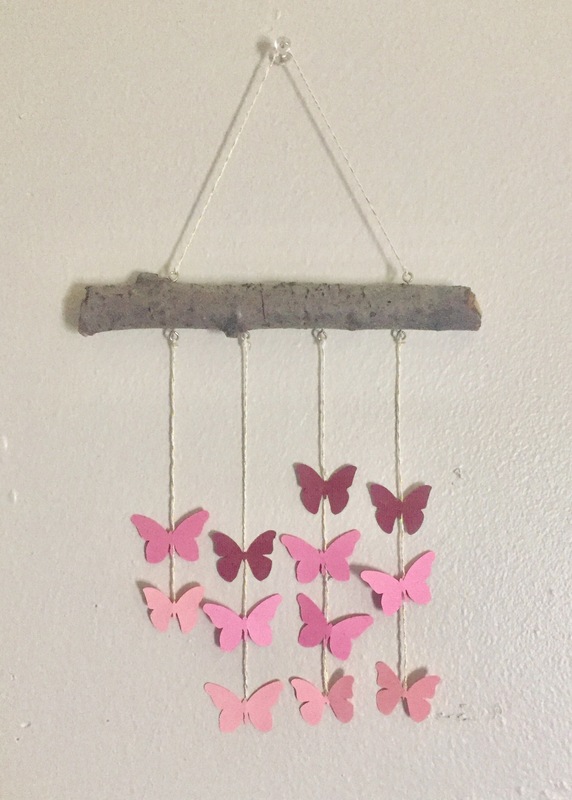 My daughter loves butterflies, so today I decided to make a simple butterfly wall hanging for her based on this pin I found on Pinterest. I can’t find the origin of the pin as the link no longer works, so I just decided to create my own version and share it with you here. For the base of the wall hanging, I saved a cool stick Lillian found on one of our walks, which I think adds an extra personal touch. 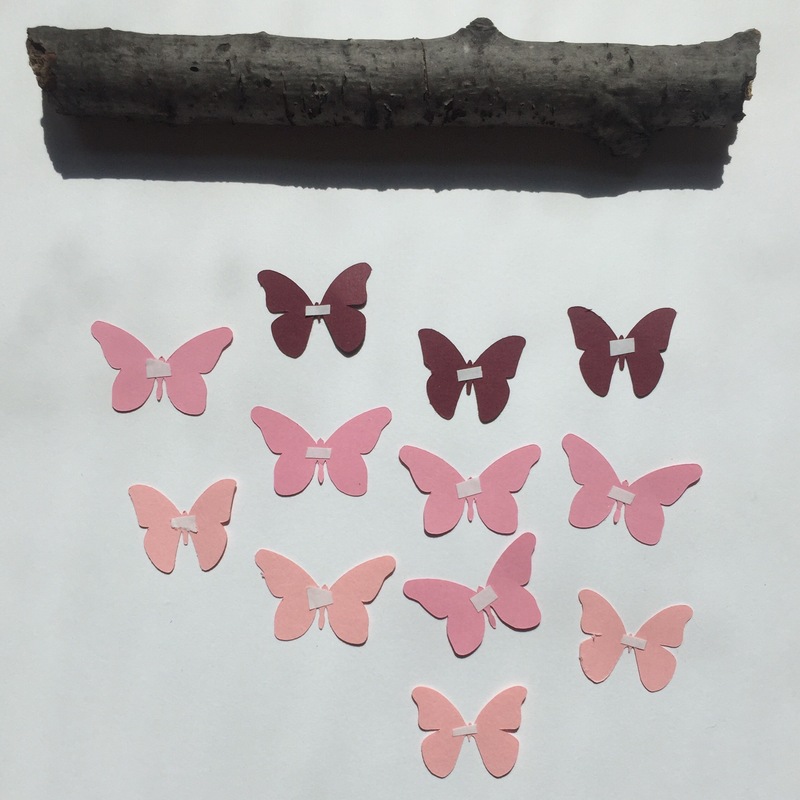 From there I cut out a few different butterfly shapes in three shades of pink to create a bit of an ombre look (I used my cricut to cut my butterflies, but you could do them by hand if you have more patience than me!). Other supplies I grabbed to use were string, little eyelets I had leftover from my DIY Jewelry Holder craft, double-sided tape, and scissors. I started by arranging my butterflies in a way I thought looked nice, and then I added little bitty pieces of the double-sided tape to the middle of the backs. Then I added different lengths of string to each set of butterflies before putting the eyelets in place on the stick. From there I just knotted the strings of butterflies to the respective eyelets, added two more eyelets on top of the stick, and tied a string on each of the top two eyelets for hanging the decoration up! For months we’ve been singing songs about butterflies, searching for them outdoors (or at Frederik Meijer Gardens when they were “in bloom”), and looking at them in pictures and books. 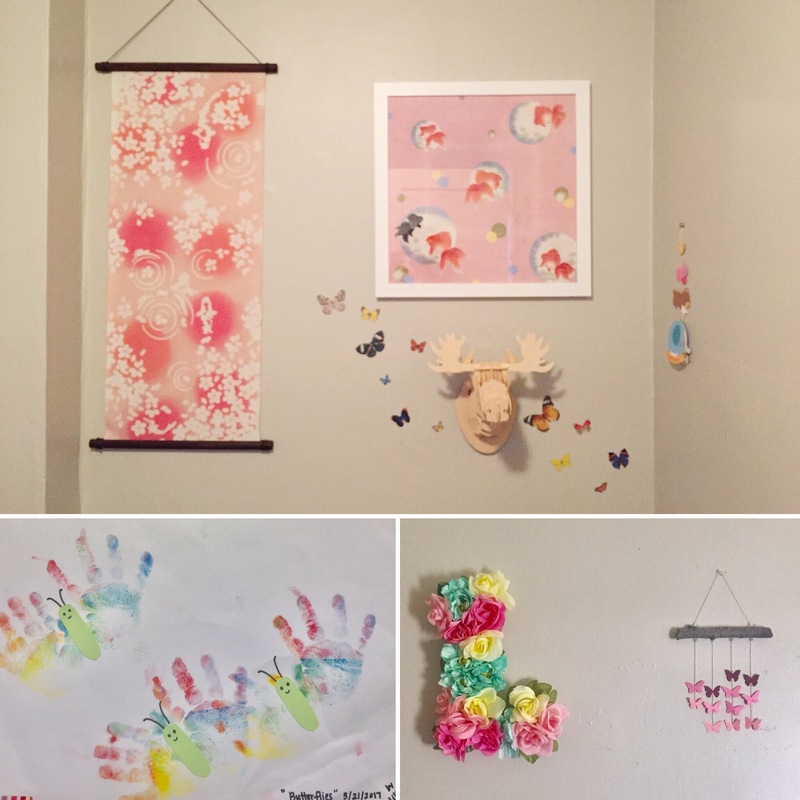 We even did a cute butterfly hand print craft a few months ago, and I added some pretty butterfly stickers from our local craft store to the wall in her room, which I think actually look really nice (pictures below)! 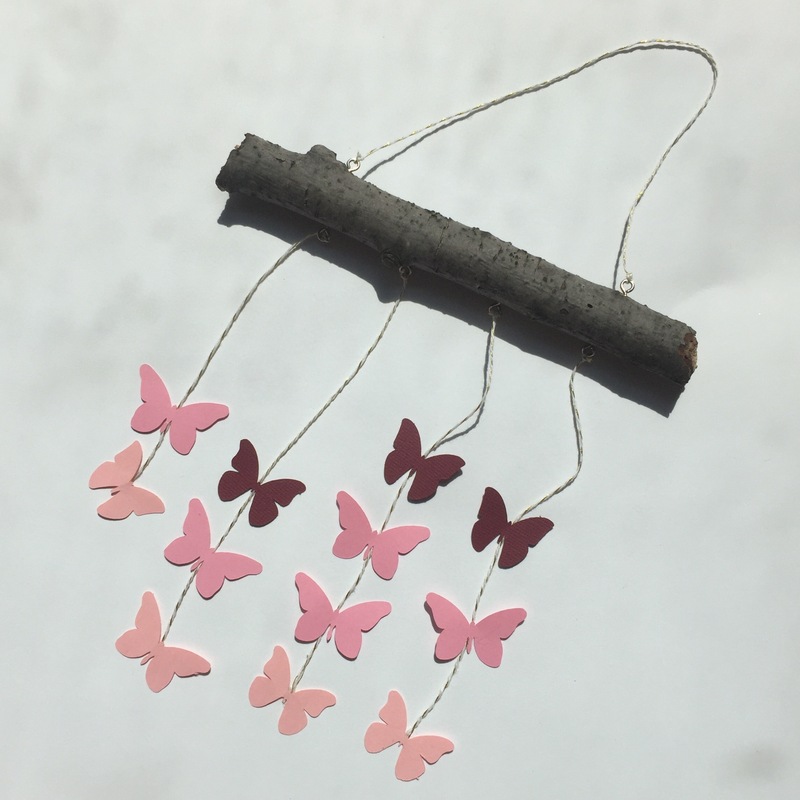 Now we have one more sweet little butterfly decoration for her room, and it was made completely with supplies I had on hand in less than an hour. I call that a win! Have you made any fun and easy decorations lately? Sometimes you just have a string of days (or heck, weeks!) that just leave you in a funk. Maybe it’s not that things are all that bad…they’re just not great. Maybe you just don’t have energy, or time, or the weather has been crummy. Or things are just leaving you feeling low in general. Recently I had a brief bout of hyperthyroidism that left me feeling fatigued and with achy muscles. I was so tired every day and felt guilty for not being more energetic with my daughter and for not doing enough around the house. Somehow after only a couple of months, the hyperthyroidism resolved itself (yeah, what? ), and though I was confused about the whole thing, I decided not to linger too much on the why and just be extra grateful! Have a good day, lovelies! So last summer I decided I wanted to make a pretty floral letter “L” for Lillian’s room, and this spring I finally got around to making it! (Oh gosh, I guess that’s how projects go sometimes when you’re a new parent!) I decided I would try to approach this project in a similar fashion to the beautiful autumn wreath I made a few years ago (oh, and the pretty little wreath my niece and I made together!). First I gathered my supplies: a foam letter “L” from the craft store, flowers from the dollar store, a glue gun and hot glue, scissors, floral wire cutters, craft paper and ribbon. Then I removed the flowers and some of the leaves from the stems using my wire cutters and scissors. Originally I started wrapping the ribbon around my letter in the same way I did with the wreaths I made, but I became kind of impatient fast because it was harder to do on a letter than on a round wreath. It occurred to me that the front of the “L” would be covered in flowers, and you wouldn’t ever see ribbon on the back of the letter, anyway. Then I thought, why not just trace the letter onto paper and glue the paper on the back? And that’s what I did. After getting the paper glued to the back of my letter, I made a general arrangement of where I wanted certain colors in bunches before I began to glue them on with my hot glue gun. Then I added leaves to a few places in the arrangement, adding additional leaves all around the edges of the letter in case any foam was showing. The back isn’t perfect, but who is going to see the back? I mean, you’re obviously seeing it now, but you get my point 😉 I used a picture hanging strip to on the back to attach the letter to the wall when I was finished (just like with my DIY jewelry holder.) And voila! A beautiful floral letter “L” for my sweet daughter’s room. This project only took me a little over an hour, and was so inexpensive and easy (especially when I decided not to mess with the ribbon!). Let me know if you try this project, and if you’ve made any other cool letter projects! For many years I’ve kept my jewelry in a cosmetic travel bag. I think a big part of my reasoning was that I was always going to be moving again, so I didn’t want to bother with jewelry holders. Eventually though, enough was enough, and I decided it was finally time to pull my jewelry out of the travel bag. Inspired by a pricey (but super nice) jewelry holder, I decided to make my own. I went to the Salvation Army and bought an old $4.00 picture frame as my base. Then I bought some cup hooks, eyelets and cork board and got to work. In the above supplies you can see my glue gun, but I was actually low on glue sticks after my air plant holder project, so I ended up using some wood glue and a staple gun for adhering the cork board. Other items I used that aren’t pictured were black paint, a paintbrush, round nose pliers and velcro damage-free hanging strips. 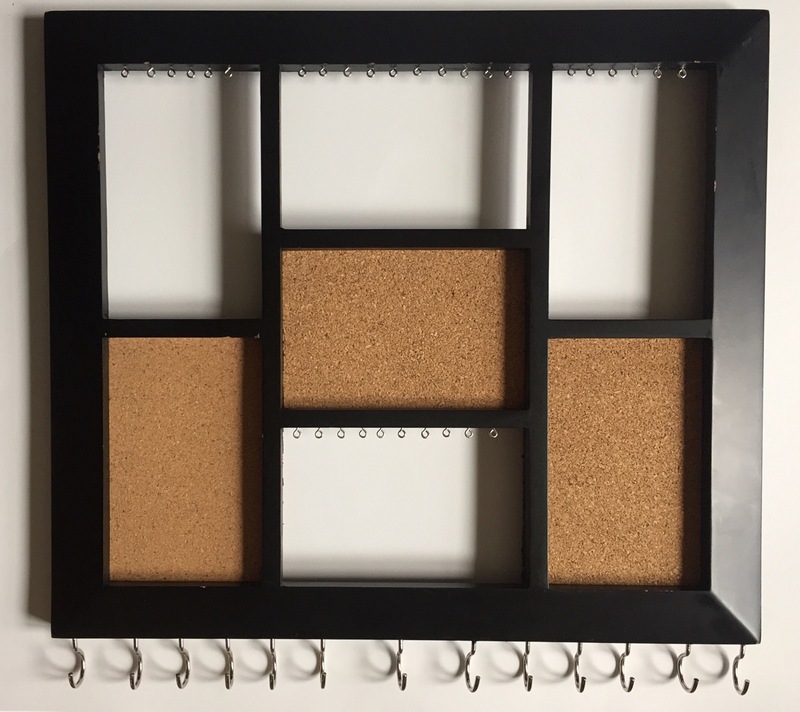 To start, I removed the backing from the frame and measured enough cork board to fill three spaces within the frame. 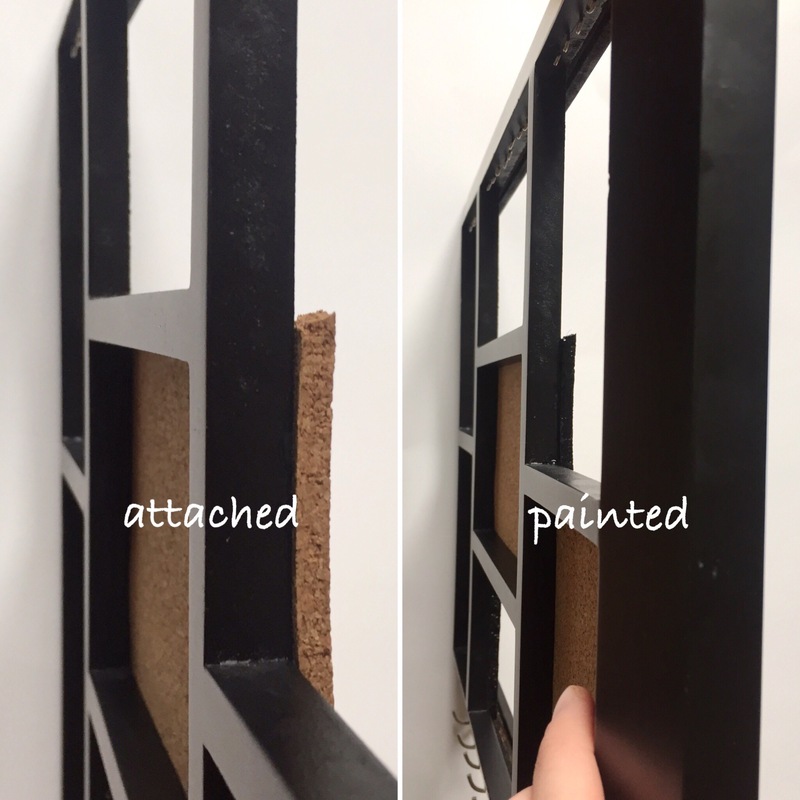 I didn’t notice until after I added the cork to the frame that the cork board edges were visible when looking at the frame from certain angles. I wanted a cleaner look, so I ended up painting the edges black, something that might be easier to do beforehand if you decide to make something similar! I added cup hooks along the bottom of the frame for necklaces and bracelets, and added eyelets with some round nose pliers for hook earrings. Be careful to choose a thick frame if you make this project so the wood doesn’t split from the cup hooks. Mine split a little, but I just reinforced it with wood glue and painted it black. Once everything was in place, I added the velcro damage-free hanging strips to the back of my frame and put it on the wall. The last (and most exciting) step was adding my jewelry. I don’t have too many stud type earrings for the cork sections of the jewelry holder, so I might tuck a little picture of Lily in the middle cork section of the frame for now. I like the frame a solid black at the moment, but it could be fun to expand the project by changing the paint color or adding fun designs with washi tape. I love that this was an easy, inexpensive project that looks pretty nice. The best part is that I can finally see what jewelry I have and start wearing more of it again! We have a really great picture window in our living room that lets sunlight pour in across the entire room. Despite the window looking directly out onto the highway, I love it, but I felt like I needed to add something to it. As I’ve already been adding lots of greenery around the house, I decided it was time to get my very first air plants. As you may know, air plants can be pretty pricey, and if you add a container of any sort like drift wood or a ladle, etc., the price goes up even higher. Of course you can find your own drift wood or cool trinket to hold an air plant in, but I wanted something I already had access to without having to do a lot of searching. And then it came to me: baby food jars. I basically used scissors, a hot glue gun and glue, baby food jars and twine to make a pretty, gradated air plant display. You could follow the same steps with other small jars, too. Next, wrap another piece of twine around the rim of the jar, hot gluing as you go. I did two layers of twine. Clean up any stray hot glue strands and hang your pretty planter! I used slipknots on mine so that I could adjust the length, but you could also measure and cut. Rather than cut right at the slipknot, I left enough twine to curl down along side the other half. Then, I just added my air plants and–viola! 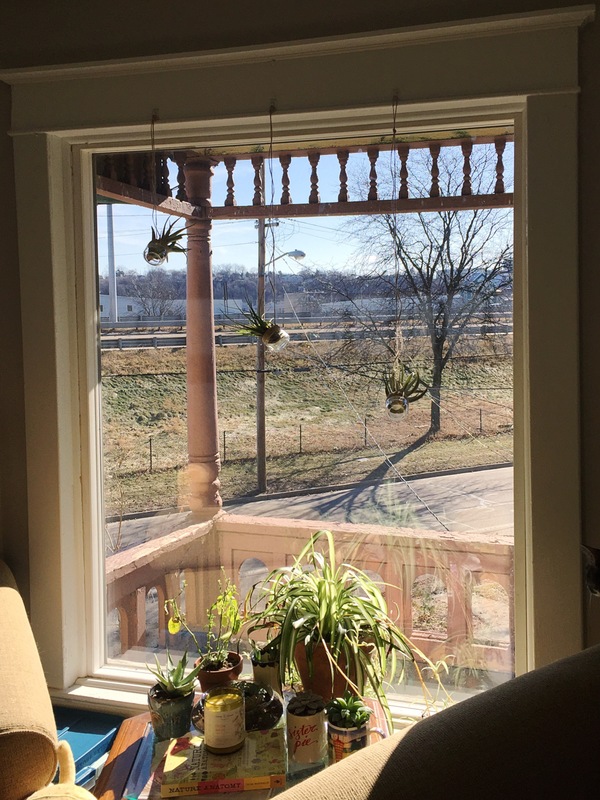 I loved this project because, aside from the air plants, I had everything I needed to make it right around the house. Plus, I think the jars turned out super cute and I am loving the extra greenery–especially on gloomy winter days! I was super spoiled on my most recent birthday with a Cricut Explore Air 2, the most amazing machine ever. I’ve been having a lot of fun learning how to use it, but I’ll be honest–there is so much you can do that I’ve also felt very overwhelmed at times! Additionally, I’ve had several projects where I thought the execution of my plans would be quick, easy and beautiful, only to find I needed to invest a lot more time than planned and learn a lot more, too. On the bright side, I *have* learned a lot, and any setbacks in creating my projects have definitely not deterred me from still jotting down loads of ideas for future creations! Today I thought I’d share about the piggy bank I made for Lillian. 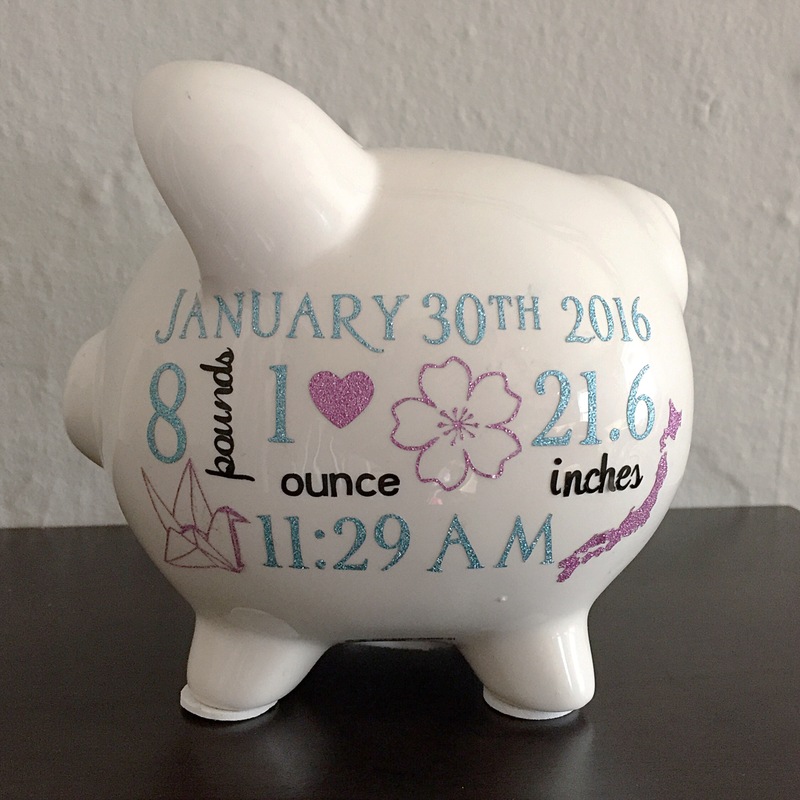 On the Cricut Design Space, my design for the sides of the piggy bank looked amazing. However, when I actually cut the vinyl, things went south. At first I couldn’t get the smaller letters free from the rest of the vinyl after it was cut, and when I finally did, all the letters were uneven and not very clean looking. Then, even after painstakingly arranging the letters again by hand, my transfer tape wasn’t picking them up properly so the design was totally uneven when applied. I also realized the pink vinyl I’d used didn’t show up on the white pig very well, so I had to get another shade of vinyl. I had already spent hours on the project only to have to basically start completely over. I wanted to throw that piggy bank. out. the. window. But…! I didn’t. Instead I tried to calm my frustration and take a break from the project. After a little over a week, I finally tackled it again. I had similar issues with removing the smaller pieces I’d cut from the vinyl sheets, but with patience things were already looking better. I used packing tape to transfer the vinyl, so that went a little more smoothly, too. And while I still have a few criticisms (I wanted one cherry blossom by her name placed differently and I wanted the birth information to be slightly lower down on the other side), I love the colors and the design (especially the origami crane and the cutout of Japan!). Part of me wanted to redo the whole thing again in attempts to make it perfect, but after hours and hours working on it, I finally decided to call it good. Sometimes it’s so hard with any kind of creative endeavor to let go and appreciate the good aspects of what you’ve made, isn’t it? At what point do you call it good? Anyway, thanks for letting me share! 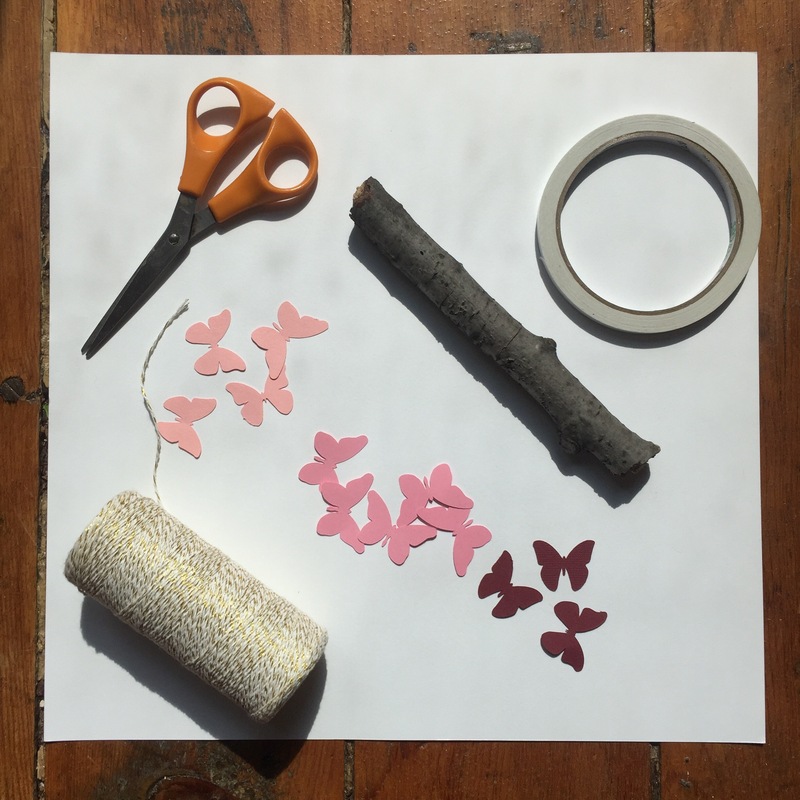 I’d love to hear about any projects you’ve been working on (and any frustrations you’ve had! ), too! a mommy in Michigan after living most of my adult life teaching preschool in Japan. love art, reading, writing, traveling, finding little cafes, learning, cooking, laughing, and most of all my sweet little daughter and my husband. lover of sweets & good news. obsessed with coffee. We felt so happy to have our friend Takahiro visit us in Michigan! His stay was too short, though. He came all the way from Mie, Japan: the first place we lived in Japan and the place where he and his family were always kind to us and were always there to show us around, teach us about Japan, introduce us to delicious food and culture, and be kind to us! We miss you already, Takahiro!